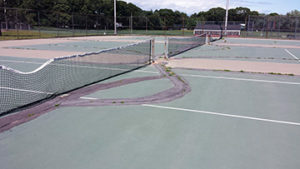 Basketball and tennis courts at Toby May Park have been completely reconstructed and resurfaced. A new handball court has also been constructed at the direction of the Parks and Recreation Commission. With proper and responsible use, the courts should provide quality recreational service for years to come. The City has already been contacted by the New England Handball Association, which has expressed interest in holding regional handball clinics and competitions here.